The bank attitude of an airplane is the angle between the airplane’s wings and the natural horizon. To maintain a straight-and-level flightpath, the wings of the airplane are kept level with the horizon (assuming the airplane is in coordinated flight). The instruments used for bank control are the attitude indicator, the heading indicator, and the turn coordinator. Figure 7-16 illustrates coordinated flight. The aircraft is banked left with the attitude indicator and turn coordinator indicating the bank. The heading indicator indicates a left turn by apparent clockwise rotation of the compass card behind the airplane silhouette. Figure 7-16. Instruments used for bank control. The attitude indicator shows any change in bank attitude directly and instantly and is, therefore, a direct indicator. 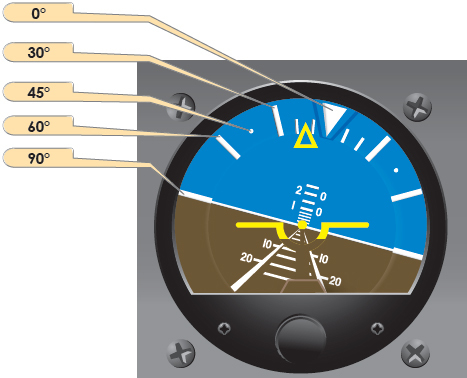 On the standard attitude indicator, the angle of bank is shown pictorially by the relationship of the miniature aircraft to the artificial horizon bar and by the alignment of the pointer with the banking scale at the top of the instrument. On the face of the standard three-inch instrument, small angles of bank can be difficult to detect by reference to the miniature aircraft, especially if leaning to one side or changing a seating position slightly. The position of the scale pointer is a good check against the apparent miniature aircraft position. Disregarding precession error, small deviations from straight coordinated flight can be readily detected on the scale pointer. The banking index may be graduated as shown in Figure 7-17, or it may be graduated in 30° increments. Figure 7-17. Bank interpretation with the attitude indicator. The instrument depicted in Figure 7-17 has a scale pointer that moves in the same direction of bank shown by the miniature aircraft. In this case, the aircraft is in a left 15° bank. Precession errors in this instrument are common and predictable, but the obvious advantage of the attitude indicator is an immediate indication of both pitch attitude and bank attitude in a single glance. Even with the precession errors associated with many attitude indicators, the quick attitude presentation requires less visual effort and time for positive control than other flight instruments. The bank attitude of an aircraft in coordinated flight is shown indirectly on the heading indicator, since banking results in a turn and change in heading. Assuming the same airspeed in both instances, a rapid movement of the heading indicator (azimuth card in a directional gyro) indicates a large angle of bank, whereas slow movement reflects a small angle of bank. Note the rate of movement of the heading indicator and compare it to the attitude indicator’s degrees of bank. The attitude indicator’s precession error makes a precise check of heading information necessary in order to maintain straight flight. When deviations from straight flight are noted on the heading indicator, correct to the desired heading using a bank angle no greater than the number of degrees to be turned. In any case, limit bank corrections to a bank angle no greater than that required for a standard rate turn. Use of larger bank angles requires a very high level of proficiency, and normally results in overcontrolling and erratic bank control. The miniature aircraft of the turn coordinator gives an indirect indication of the bank attitude of the airplane. When the miniature aircraft is level, the airplane is in straight flight. When the miniature airplane is aligned with one of the alignment marks and the aircraft is rolling to the left or right the indication represents the roll rate, with the alignment marks indicating a roll of 3 degrees per second in the direction of the miniature aircraft. This can be seen in level flight when a bank is introduced either to the left or the right. The turn coordinator’s indicator will indicate the rolling motion although there is no turn being made. Conversely, a pedal input to the right or left causes the aircraft to turn momentarily about its vertical axis (with no rolling motion) with an indication of turn on the turn coordinator. After the turn becomes stabilized and the aircraft is no longer rolling, the turn coordinator displays the rate of turn with the alignment marks equaling a turn of 3 degrees per second. The turn coordinator is able to display both roll and turn parameters because its electrically-powered gyroscope is canted at an angle. As a result, the turn-and-slip indicator provides both roll and turn indications. Autopilots in general aviation today use this instrument in determining both roll and turn information. After the completion of a turn, return to straight flight is accomplished by coordinated aileron and rudder pressure to level the miniature aircraft. Include the miniature aircraft in the cross-check and correct for even the smallest deviations from the desired position. When this instrument is used to maintain straight flight, control pressures must be applied very lightly and smoothly. The ball of the turn coordinator is actually a separate instrument, conveniently located under the miniature aircraft because the two instruments are used together. The ball instrument indicates the quality of the turn. If the ball is off-center, the airplane is slipping or skidding. That is, if the coordinator’s miniature airplane is tilted left and the ball is displaced to the right, the aircraft is in a skid. [Figure 7-18] If however, the miniature airplane is tilted to the right with the ball off-center to the right, the aircraft is in a slip. [Figure 7-19] If the wings are level and the airplane is properly trimmed, the ball remains in the center, and the airplane is in straight flight. If the ball is not centered, the airplane is improperly trimmed. To maintain straight-and-level flight with proper trim, note the direction of ball displacement. If the ball is to the left of center and the left wing is low, apply left rudder pressure to center the ball and correct the slip. At the same time, apply right aileron pressure as necessary to level the wings, cross-checking the heading indicator and attitude indicator while centering the ball. If the wings are level and the ball is displaced from the center, the airplane is skidding. Note the direction of ball displacement and use the same corrective technique as for an indicated slip. Center the ball (left ball/ left rudder, right ball/right rudder), use aileron as necessary for bank control and retrim. To trim the airplane using only the turn coordinator, use aileron pressure to level the miniature aircraft and rudder pressure to center the ball. Hold these indications with control pressures, gradually releasing them while applying rudder trim sufficient to relieve all rudder pressure. Apply aileron trim, if available, to relieve aileron pressure. 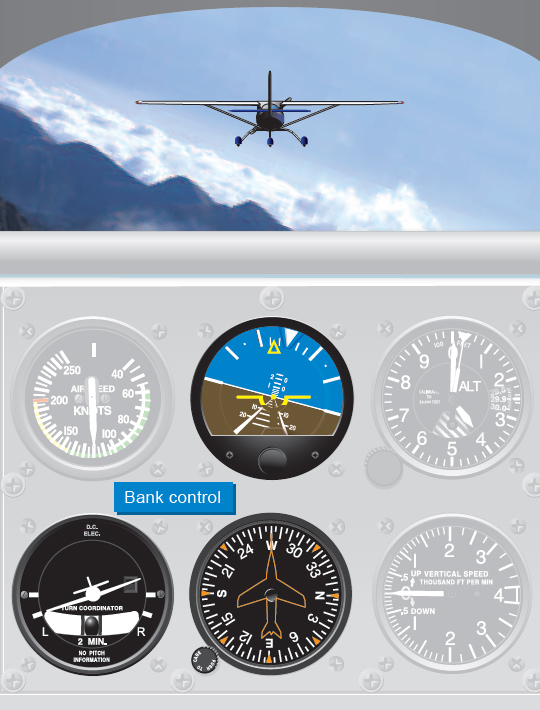 With a full instrument panel, maintain a wings-level attitude by reference to all available instruments while trimming the airplane. Unlike the turn coordinator that provides three indications (roll, turn, and trim), the turn-and-slip indicator provides two: turn-rate and trim. Although the turn-and-slip indicator needle provides an indication of turn only, it provides an indirect indication of aircraft attitude when used with roll indicators, such as a heading indicator or magnetic compass. As with the turn coordinator (after stabilizing from a roll), when the turn-and-slip indicator’s needle is aligned with the alignment marks, the aircraft is in a standard turn of 3 degrees per second or 360° in 2 minutes. The ball of the turn-and-bank indicator provides important trim in the same manner that the ball in the turn coordinator does. Figures 7-18 and 7-19 provide a comparison of the two instruments.